Singapore generated more than 50 million tonnes of greenhouse gases in 2014, the bulk of it from the burning of fossil fuels to generate energy for industries, buildings, households and transportation. LOCAL firms’ payment performance deteriorated in the last quarter of 2018, making for three straight quarters of worsening. TROUBLE at Coastal Oil Singapore, a crude oil products supplier which has filed for liquidation, has hit at least 10 banks, including all three Singapore banks which are owed about half of the total debt of US$354 million, as well as Cosco Shipping International (Hong Kong). A SilkAir flight had to turn back and make an emergency landing at Chiang Mai Airport on Tuesday (Jan 8) due to a suspected hairline crack in a cockpit window, resulting in a delay of more than 10 hours. Nanyang Technological University (NTU) and beverage company Fraser and Neave (F&N) on Monday (7 January) jointly opened a laboratory, kickstarting a four-year partnership to develop healthier products and greener packaging. A Scoot airplane was forced to turn back to Changi Airport less than an hour into its flight to Melbourne on Tuesday (Jan 8) due to a fault in its weather radar. Visitors to Orchard Road, Singapore’s main shopping belt, will find fancy malls, trendy department stores, abundant food courts – and a small farm. Credit Suisse is recommending Singapore investors stick with a portfolio of quality, high-yield stocks and stocks with low embedded expectations to ride out any volatility in 2019 while positioning for a market recovery. The iconic Golden Mile Complex may be developed as an integrated project with a gross floor area (GFA) of 85,977.5 sq m if it finds a buyer, but its landmark main building will have to be retained, the Urban Redevelopment Authority (URA) said. When Singapore decided to build a new and bigger passenger terminal at Seletar Airport – which opened in November – the plan was to introduce an Instrument Landing System (ILS). Malaysia will immediately suspend its permanent restricted area in the airspace over Pasir Gudang, while Singapore will similarly suspend its implementation of Instrument Landing System (ILS) procedures for Seletar Airport. Tan Tock Seng Hospital (TTSH) has taken disciplinary action, which included warnings and financial penalties, against 18 staff who were responsible for a safety lapse at the hospital’s dental clinic. Singapore’s consumer watchdog issued a fresh warning against Danish online retailer LuxStyle yesterday, after consumers received letters from a debt collection firm last month, asking them to pay for purchases they did not make. The Singapore National Eye Centre has promised to cut charges for complex procedures, days after an 82-year-old revealed that MediShield Life paid out only $4.50 of his $4477 post-subsidy bill for cataract surgery at SNEC because there the national health insurance scheme imposes a $2,800 cap on such procedures. The special Bicentennial Edition of the annual i Light Marina Bay art festival will for the first time extend to the historic Raffles Terrace at Fort Canning Park, as Singapore commemorates the 200th anniversary of the arrival of Sir Stamford Raffles on the island. DBS, UOB or OCBC: Who has a Better Share Valuation for 2019? 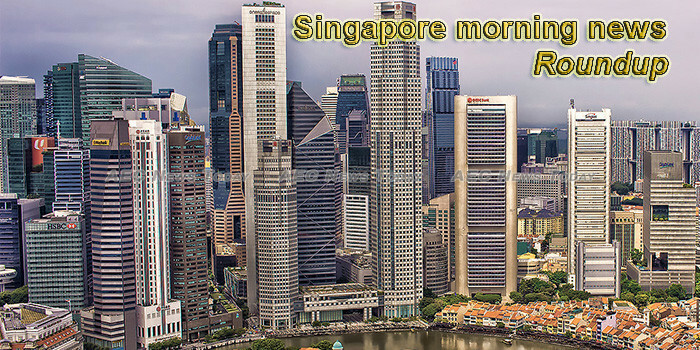 Singapore Exchange (SGX) on Tuesday signed a new cooperation agreement with the China-Singapore (Chongqing) Demonstration Initiative on Strategic Connectivity (CCI) Administrative Bureau, as part of its efforts to support Singapore-China financial cooperation. CHINA Taiping Insurance Singapore has launched its life insurance business here citing the significant market for savings, retirement and protection products fuelled by increasing wealth in the Asia-Pacific. NASDAQ-LISTED Equinix plans to build a fourth data centre in Singapore at an initial cost of US$85.3 million. The Agri-Food and Veterinary Authority of Singapore (AVA) is authorised to make arrests for offences that fall under nine Acts and their subsidiary legislation. Myanmar nationals in Singapore will be able to send money home using mobile wallet Singtel Dash from March, under a new grant agreement signed yesterday. The Government will take over the administration of ElderShield from private insurers in 2021, a move that will allow policyholders a smoother upgrade to CareShield Life, a new national disability insurance scheme scheduled to be introduced next year. Investing in equities for the long-term provides the best chance to grow and compound your wealth. IN recent months, tens of thousands of Singaporeans have attended government-organised workshops that would help them find courses that could expand their skill sets and uplift their careers. A look at the valuation and financial data of the best shares in Singapore’s stock market for 2019 according to the Magic Formula. CHONGQING • Singapore and Chongqing companies yesterday inked nine deals in such areas as fintech, financial services and technology. Huawei, the world’s second largest smartphone manufacturer, today announced that it will open its second Customer Service Centre in Westgate, Singapore on 11 January 2019. Huawei’s products and services are available in more than 170 countries, and are used by a third of the world’s population. Oil giant Shell has been fined $400,000 for a health and safety breach that led to a fire at the Pulau Bukom petroleum refinery which left six workers with burns. The official light-up and opening ceremony of Chinatown’s annual Chinese New Year celebrations are not due till Jan 20, but preparations have set people talking. Will Founders’ Memorial station be another white elephant like the one in Buangkok? WHEN he led Autodesk’s Asia sales team, Denis Branthonne wanted to sell the engineering and architecture software that his company was famous for.